A good idea in theory…? I’m proud to say that I’ve based this blog on the idea that sometimes even the most bizarre or outlandish sounding food products – even partially popped popcorn kernels or a red wine and milk chocolate drink, can astound and delight an eater who approaches the world with an open mind. Not this time though. 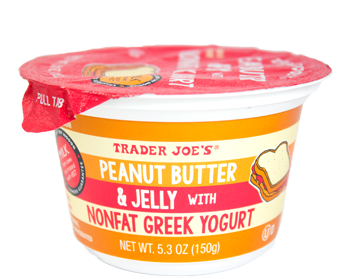 Trader Joe’s new Peanut Butter and Jelly with Nonfat Greek Yogurt looks and smells and tastes terrible. Just really awful. Yeah, I know that probably doesn’t strike you as an astounding verdict or anything, so before I start systematically eviscerating this poor, hapless product I thought I’d take a moment to find some praise for it – faint though it may be. Kudos – kudos I say! – to Trader Joe’s for not giving a good goddamn what anybody else in the world thinks. 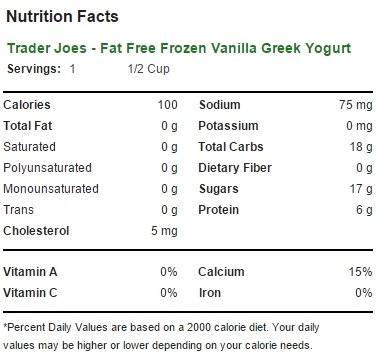 There was zero demand for a no fat, peanut butter and strawberry jelly flavored greek yogurt. Exactly zero people were standing around demanding this mash up of a soggy sandwich and a tasteless dairy culture, but someone at Trader Joe’s was sure as hell going to give it to us any way. “Sir, the PB&J greek yogurt is a complete flop! No one is buying it!”, no doubt come the cries. Anyone can play it safe. It’s the bold innovators who deserve the acclaim. Long may you thrive, Trader Joe’s! 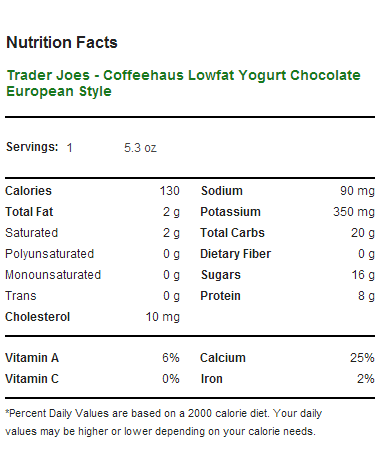 That said, this yogurt is really dreadful. I really wanted to like it, even in the face of the atrocious sounding name, if for no other reason than the packaging is kind of cute. Sadly, the contents don’t live up to even this promise. Peanut butter and greek yogurt have similar textures, I had reasoned, maybe it’ll be rich and creamy and sweet and – nope. Nope, none of that. It’s not even peanut butter colored – just sort of a dismal gray. Well, I thought, maybe the strawberry jelly is sort of included as a fruit-on-the-bottom type sweet surprise that – nope. Nope, no jelly on the bottom. 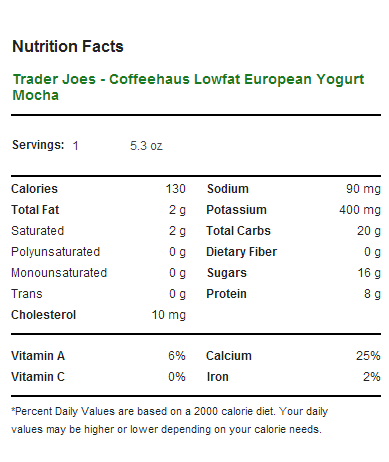 Instead, the peanut butter and jelly flavors have blended into each other, along with the tart, plain greek yogurt. Shockingly, the ingredient label shows that real strawberries have actually gone into this. Shocking, I say, because they are impossible to discern in this undifferentiated gray mass – neither in texture nor taste. The PB&J sandwich is an American classic. This yogurt tastes nothing like it – only the vaguest elements of peanut butter are detectable, and only the faintest taste of strawberries shows up. If you have ever soaked a PB&J sandwich in skim milk until it started to fall apart, then tried to eat it, that is pretty much exactly like what you are getting here. 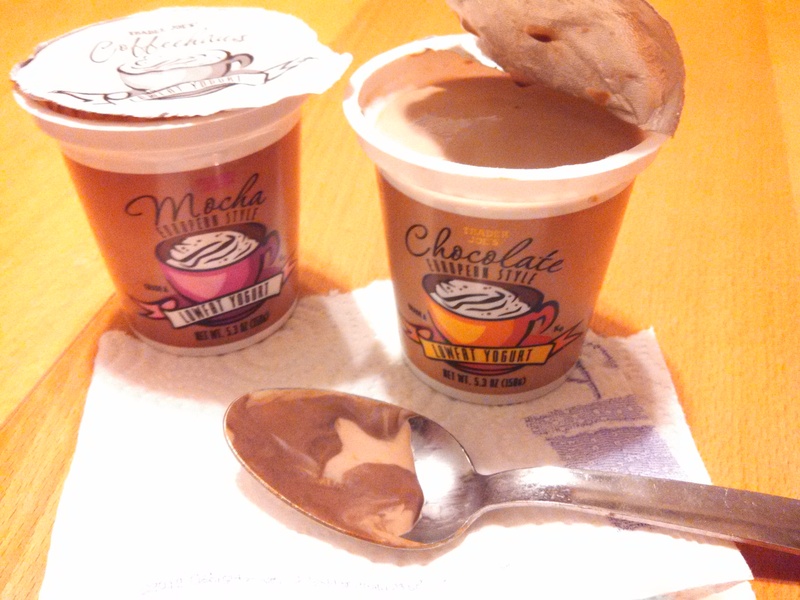 All you really end up tasting is a blur of tartness, muddled with hard to place indistinct flavors. 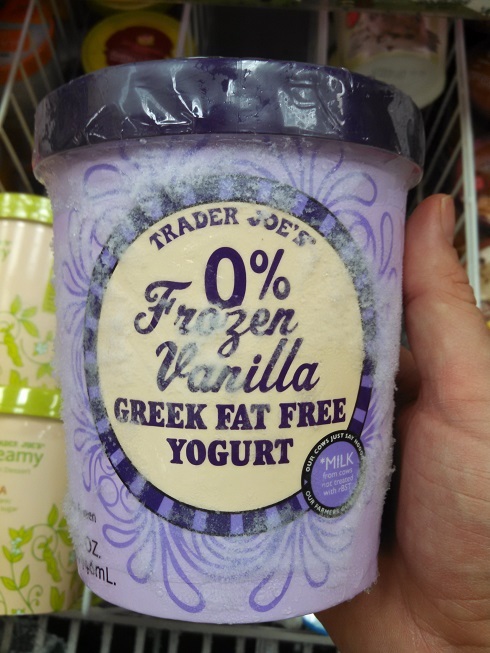 It may only be $0.99, but even that is asking too much when Trader Joe’s offers such a wide range of far tastier nonfat greek yogurts. I remember figuring out that mushing together everything in my lunch bag was a bad idea back in Elementary school. Trader Joe’s has done an excellent job of reminding me why. Would I Recommend It: Nope. Would I Buy It Again: Not unless I feel like wasting food. Final Synopsis: Theoretically, a peanut butter and jelly infused greek yogurt. Practically, a gross, gray glob.